This version uses salt-packed anchovies instead of the usual olive-oil packed variety. Soak anchovies in 1/2 cup warm milk, press out liquid with a wooden spoon and proceed as normal. 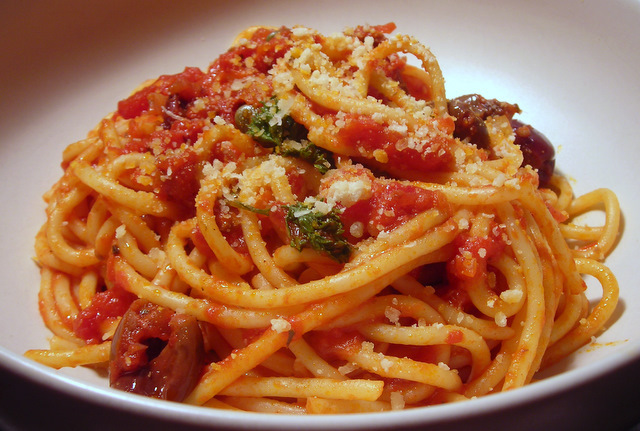 Puttanesca sauce consists of crushed garlic warmed in olive oil, to which are added anchovies, crushed tomatoes, capers, olives and occasionally peperoncini or red pepper chile flakes. Goes well with a glass of pinot noir or other robust-flavored red wine. 28 May	This entry was published on May 28, 2011 at 3:20 am. It’s filed under food, food photography, general, Italian food, summer and tagged anchovies, capers, dinner, food photography, olives, pasta, spaghetti, tomatoes. Bookmark the permalink. Follow any comments here with the RSS feed for this post. A good pasta and a glass of wine remains my favorite meal; give me a good salad (no rubbish) and it can’t be beat !